With an International reputation in Toys & Dolls, Morphy Auctions has the pleasure of selling some of the best collections of toys to ever hit the market. 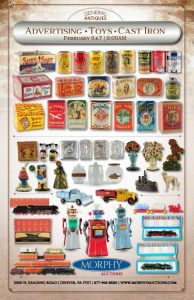 Whether you collect marbles, trains, robots, figural cast iron or tin toys, we have an expert to handle every part of your collection. 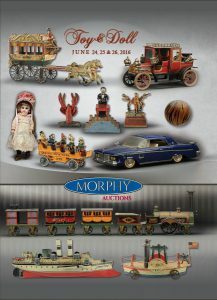 Tom Sage, Jr. is the Head of the Toy Division and joined forces with Dan Morphy in 2004 to establish Morphy Auctions. Tommy is well known in the industry for his expertise in toys, trains and sports memorabilia. His primary duties are to gather consignments, provide catalog descriptions and to represent Morphy Auctions at various shows around the world. Tommy grew up in the antiques trade and attended his first show with his father at the age of six, started selling trains at the age of 12 and ran his first antique shop in the Poconos at the age of 16. It’s not surprising that the younger Sage was attracted to the antiques trade at an early age. He recalls, “I was exposed to the business through my father, a long-time dealer, and was able to learn what collectors wanted, how to find it, and who to sell it to.” In the 1980s, Tommy relocated to the Adamstown, Pa., area to continue his pursuit of the antiques business. He is now an integral part of Morphy Auctions and brings vast knowledge and experience to the forefront of the company’s daily operations. For centuries, mechanical and still banks have been a toy produced to help educate children on saving money. A still bank is is a money box designed to store coins. A mechanical bank is a toy bank in which a coin is deposited by a mechanical process that is usually activated by pushing a lever. Dan Morphy has been collecting mechanical and still banks for 30 years. He grew up in a family of avid collectors, with his parents constantly encouraging the appreciation of antiques in the home and fostering a love of collecting among their children. Dan Morphy wrote and published The Official Price Guide to Mechanical Banks which provides an in-depth guide to collecting mechanical banks and is known as the #1 mechanical bank reference book. Dan’s book also provides information and references for identifying fakes and reproductions, how to detect repairs and restoration, grading and how to build a mechanical bank collection. This book can be purchased through Morphy Auctions for $100 . Also in 2007, Morphy Auctions sold the Stephen Steckbeck Mechanical Bank Collection for a world-record $7.7 million. Active member of Mechanical & Still Bank Collectors Club. 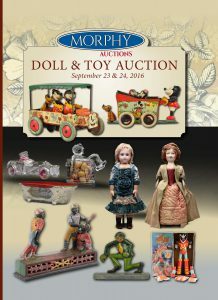 Jay Lowe joined Morphy Auctions team as the Head of the Doll Division in 2015 as a result of Morphy’s purchase of James D. Julia’s Antique Toy, Doll, Coin-operated Machine and Advertising Division. While at Julia’s, Jay was responsible for some of Julia’s most successful doll and toy sales events over the past decade. Jay specializes in the identification and valuation of antique dolls and related materials, but is also a nationally recognized expert on trains, coin-operated machines, and advertising. He has over 45+ years professional experience in the toy trade, beginning as a youngster in 1968 when he started focusing on fine vintage trains. His interests grew to include coin-operated machines in 1971 and antique dolls in 1981. Jay was fortunate to learn firsthand from many old time, legendary collectors and dealers who today are considered pillars of the vintage toy industry. Jay is an active and veteran member of several well-known professional toy societies, including United Federation of Doll Clubs, National Antique Doll Dealers Association, Train Collectors of America, Schoenhut Club, Antique Toy Collectors of America, and Coin Operated Collectors Association. He was a guest appraiser on season 15 of the iconic PBS “Antiques Roadshow” TV program. Jay and his team of six experts are committed to growing Morphy’s Doll Division into the preeminent and most respected auction choice for buyers and sellers from all over the world, and to helping customers reach their collecting or deaccessioning objectives. 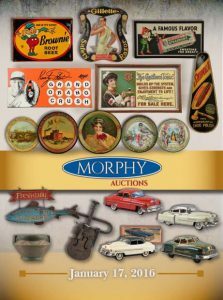 John & Nancy Smith joined Morphy Auctions in the spring of 2004 as our figural cast iron consultants. As widely recognized authorities on doorstops and figural cast iron, they provide the catalog descriptions on much of the figural cast iron offered in sales conducted by Morphy Auctions. Tommy Sage joined forces with Dan Morphy in 2004 to establish Morphy Auctions. Tommy is well known in the industry for his expertise in toys, trains and sports memorabilia. His primary duties are to act as chief operating officer of Dan Morphy Auctions, to gather consignments, provide catalog descriptions, and to represent Dan Morphy Auctions at various shows around the world.Tommy grew up in the antiques trade and attended his first show with his father at the age of six, started selling trains at the age of 12 and ran his first antique shop in the Poconos at the age of 16. It’s not surprising that the younger Sage was attracted to the antiques trade at an early age. He recalls, “I was exposed to the business through my father, a long-time dealer, and was able to learn what collectors wanted, how to find it, and who to sell it to.” In the 1980s, Tommy relocated to the Adamstown, Pa., area to continue his pursuit of the antiques business. He is now an integral part of Dan Morphy Auctions and brings vast knowledge and experience to the forefront of the company’s daily operations. 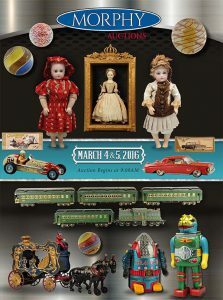 Jay Lowe joined the Dan Morphy Auctions team as the Head of the Doll Division in 2015, as a result of Morphy's purchase of James D. Julia's Antique Toy, Doll, Coin Operated Machine and Advertising Division. While at Julia’s, Jay was responsible for some of Julia’s most successful doll and toy sales events over the past decade. Jay specializes in the identification and valuation of antique dolls and related materials, but is also a nationally recognized expert on trains, coin-op machines, and advertising. He has over 45+ years professional experience in the toy trade, beginning as a youngster in 1968 when he started focusing on fine vintage trains. His interests grew to include coin-operated machines in 1971 and antique dolls in 1981. Jay was fortunate to learn firsthand from many old time, legendary collectors and dealers who today are considered pillars of the vintage toy industry. 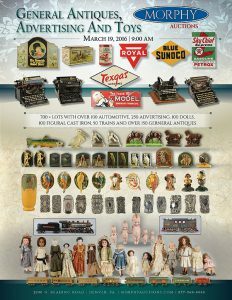 Jay is an active and veteran member of several well-known professional toy societies, including United Federation of Doll Clubs, National Antique Doll Dealers Association, Train Collectors of America, Schoenhut Club, Antique Toy Collectors of America, and Coin Operated Collectors Association. He was a guest appraiser on season 15 of the iconic PBS “Antiques Roadshow” TV program. 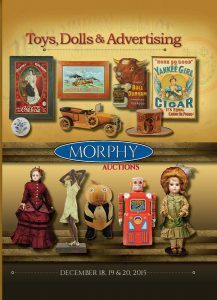 Jay and his team of six experts are committed to growing Morphy’s doll division into the preeminent and most respected auction choice for buyers and sellers from all over the world, and to helping customers reach their collecting or deaccessioning objectives. John and Nancy Smith joined Dan Morphy Auctions in the spring of 2004 as our figural cast iron consultants. As widely recognized authorities on doorstops and figural cast iron, they provide the catalog descriptions on much of the figural cast iron offered in sales conducted by Dan Morphy Auctions.John and Nancy are the authors of The Doorstop Book – An Encyclopedia of Doorstop Collecting, and have been avid collectors of cast iron, folk art and country Americana for more than 35 years. As dealers trading under the name “American Sampler,” they have appeared at major antique shows since 1971 and are always available to answer any questions concerning Dan Morphy Auctions and consignments. John is the founder of the Figural Cast Iron Collectors Club, and both he and Nancy have been members of the Still Bank Collectors Club of America since 1971. Based in Barnesville, Md., John and Nancy are busy exhibiting at shows, updating their Web site, and gathering consignments Dan Morphy Auctions. Dan Morphy Auctions is pleased to have this dynamic duo as a part of the team. Dan Morphy, owner and chief executive officer of Dan Morphy Auctions and founder of the Adamstown Antique Gallery in Denver, Pa., also acts as the mechanical and still bank specialist for the company.Dan grew up in a family of avid collectors, with his retired physician father, John Morphy Sr., and his mother, Janet, constantly encouraging the appreciation of antiques in the home and fostering a love of collecting among their children. “I grew up around antiques and attended many shows and auctions with my dad at a very early age,” Dan said. At the age of 10, Morphy started buying still banks through the mail. Within a few years, he was both buying and selling mechanical banks through various sources and meeting collectors who are now among the most revered in the hobby. And while he has bought, sold and collected 30 to 40 different types of antiques over the years, Morphy says it is mechanical banks that have consistently held his fascination.Dan is deeply invested in the day-to-day operations of Dan Morphy Auctions and the antiques industry, and also supports and belongs to many collector clubs. His exceptional knowledge and experience with mechanical banks was shared with the hobby worldwide through the writing and publication of Dan Morphy’s Price Guide to Mechanical Banks, which is considered the premier reference in its category. Tom Hathazy joined the Dan Morphy Auctions team in the winter of 2005 as our pressed steel/pedal car consultant. Tom came highly recommended because of his extensive knowledge of Sturditoy, Buddy ‘L,’ Steelcraft, Sonny, Kingsbury and Keystone are obvious from the professional catalog descriptions, conditions and appraisals he provides for our pressed-steel items.Tom’s interest in antiques started with his love of antique cars. He had already been an active collector and hobbyist for more than 20 years when he purchased his first piece of pressed steel in the mid-1980s at the Hershey Car Show. Tom was a history teacher whose love of the past turned to the history of the pressed-steel toy companies. His experience with antique car paint restoration and non-original parts became the foundation for his understanding of pressed-steel toys. 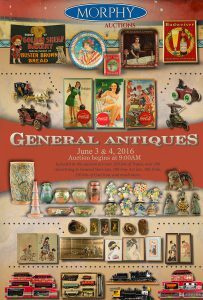 Over the years he had amassed such an extensive collection that he became active in the business and enjoys bringing new collectors into the hobby to share his love of antiques. Morphy’s is pleased to have Tom as a part of the team.